Learning what it is and what is undertaken in an organic vineyard: the importance of a vegetation cover, biological pest control, the role of hedges and insects, indigenous yeasts and the importance of the soil in wine. We want you to understand the reason behind why our wines belong to their soil..
* Duration approximately in minutes of each part of the visit. 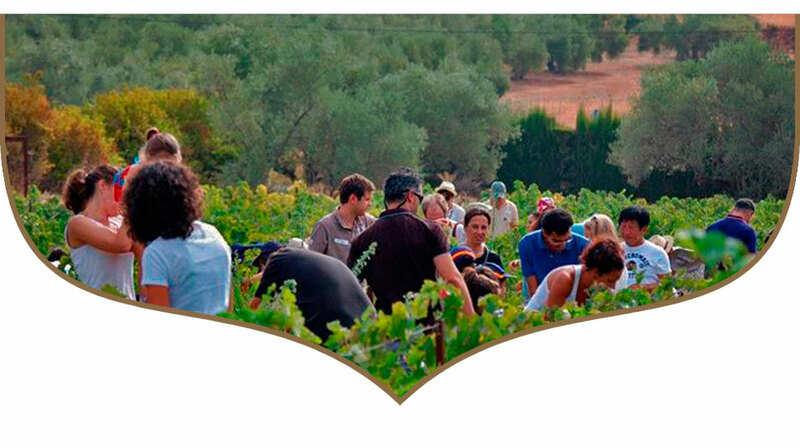 20 minutes: Visit to the organic vineyard. Explanation of vineyard management project with vegetation cover, developed in collaboration with the University of Cordoba and recognised by the Ministry for the Environment in 2006, with the award for “Best ecological company in Spain”. Nowadays, the vineyard is regularly visited by technicians of the Government of Andalusia as regards their organic management training. 10 minutes: Presentation of the “Keep an eye on your vine” (patronage or hosting of the vineyards) program. One can follow, for free, the evolution of a vine from our organic vineyard: worry about the weather, endure pests and enjoy watching the beauty of veraison (ripening of the grapes), the weeping vines, budding (or budbreak). One can also visit the vineyard, carry out its tasks and attend the meetings which are regularly organised: pruning, tipping (or pinching off), thinning, the harvest and the arrival of new wine. 15 minutes: Visit to the winery and explanation of the winemaking method. Biological ageing under flower veil (cap or “flor” of yeast), oxidative ageing and mixed system: Ageing via solera and criadera system. Our wines are fermented using indigenous yeasts which are present in the soil of the vineyard and reaches the winery attached to the skin of the grape. That is why the ecological care of our vineyard is so important. 30 minutes: Classification of wines and guided wine tasting. species such as cloverleaf, poppies, legumes.